Colors mean different things to different people. When it comes to awareness causes, colors have a life of their own. None is more well-known than the color pink, which has become synonymous with breast cancer awareness. Pink wristbands can be used for other causes as well. Often, pink is used in conjunction with blue for issues related to children and babies. Pink wristbands are also popular for girls' birthday parties and baby showers. 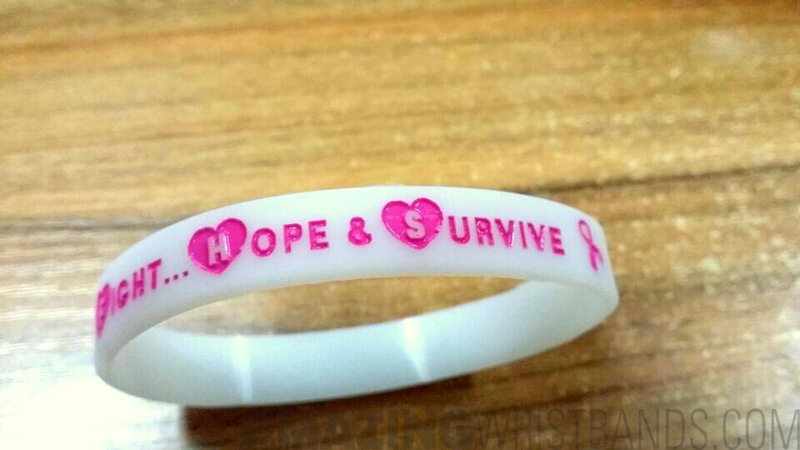 Buy pink wristbands to show your support for breast cancer awareness! What is the Meaning of Pink? Pink is a combination of the color red and white, a hue that can be described as a tint. It can range from berry (blue-based) pinks to salmon (orange-based) pinks. Pink is associated with femininity, although that hasn't always been the case. There was a time in history when pink was for boys and blue was for girls! Today, pink is known not just for its association with girls and women, but also as a symbol of vitality and strength. With its roots in red, pink can mean action, power, and beauty. 100% silicone that are non-allergenic and latex free. We never supplement our silicone products with fillers such as latex. Our wristbands come in a variety of sizes and widths, including half-inch bands, thicker one-inch bands, and adjustable wristbands. AmazingWristbands.com also offers popular slap bands that "snap" to a person's wrist, USB bands, silicone rings and silicone key chains. Create your pink wristbands today!